These delectable dumplings are first fried and then steamed, endowing them with a fabulous dual texture. The smooth, luscious noodlelike wrapping and the tender, meaty filling complement the handsomely browned bottom crust. Round gyoza wrappers, available in Asian markets and many supermarkets, are ideal here, but wonton wrappers work wonderfully if you trim off the four corners before wrapping your dumplings. Though these treats are quick and easy to cook, the mixing and wrapping steps take a little time. Plan to make them a day ahead and refrigerate or freeze them. Or follow Chinese tradition and invite guests to come fill, shape, and cook dumplings along with you, making the preparation and cooking part of the party. In a large bowl, combine the pork, green onion, soy sauce, sesame oil, ginger, salt, and sugar. Squeeze the spinach with your hands or press it into a strainer, extracting most of the water. Add the spinach to the bowl and use a large spoon or your hands to mix everything together until all the seasonings are incorporated and the spinach and green onion are evenly mixed in. To fold the dumplings, set up a work space with a dry cutting board, a small bowl of water for sealing the dumplings, the stack of wrappers, and the pork mixture. 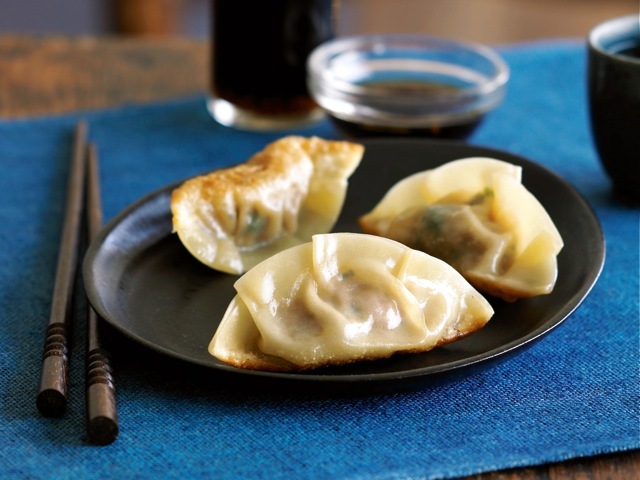 To shape a potsticker dumpling, place a wrapper on the cutting board. Scoop up a generous tablespoon of pork filling and place it in the center of the wrapper. Using your index finger, lightly moisten the outside edge of the wrapper. Fold it in half, enclosing the filling and pinching the top edges to make a tight seal. Try to squeeze out any air bubbles that may form. Create 3 small pleats on one side of the seal, folding toward the center and pressing to seal it well. Form 3 small pleats on the other side and press the entire sealed edge. Press the sealed edge down lightly to plump up the dumpling and make it stand up straight. Continue folding dumplings in this way, one at a time, or setting up 3 or 4 wrappers at a time for an assembly line. Place the folded dumplings in rows on a dry platter, so that they don’t touch each other. Heat a 10-inch nonstick skillet over medium-high heat and then add the vegetable oil and swirl to coat the pan. Carefully place about 12 potstickers in the pan, tucking them to form a circle in one direction; squeeze a few into the center if you can. (Packing them tightly is fine.) Place a serving platter by the stove to hold the cooked dumplings. Let them cook undisturbed for 1 to 2 minutes, until the bottoms of the dumplings are a pale golden brown. Holding the lid in one hand, add ½ cup water around the sides of the pan and then cover quickly. Let the potstickers cook for 8 minutes, then uncover the pan. Continue cooking 1 to 2 minutes more, shaking the pan gently to discourage them from sticking too much. When the water has evaporated and the dumplings are a handsome crispy brown, turn them out bottom-side up onto a serving platter. Serve hot or warm, with Ginger-Soy Dipping Sauce. You could also used blanched fresh spinach: Drop about 4 cups loosely packed spinach into a small pot of boiling water, let cook 1 minute, drain well, squeeze gently but firmly to extract water, coarsely chop, and measure out 1/4 cup. To use napa cabbage or regular cabbage, you could chop it finely and use it raw or blanched.